We sisters in our monastery on Lake Starnberg near Munich are surrounded by wealth. But this should not blind us for the social problems of people who do not live such a good life. One of our sisters, Sr. Antonia Hippeli, who started to work as a medical doctor in a house for casual homeless and people in need wanted to make us aware of these people who live on the shady side of life and we should see for ourselves the problems that are ongoing in the city. 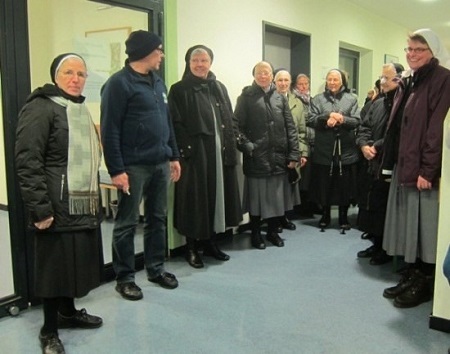 14 sisters from Tutzing and Bernried took up BISS (citizens in difficult situations, Burger in schwierigen Situationen) on their offer for a special tour of institutions needy and homeless people. Our first stop was the Railway Mission, a social institution which is open for every kind of people and help. Every day they have 200 to 300 people, 75% men and 25% women. 80% of all of them are migrants and 90% of them have social problems like homelessness, alcoholism, and psychiatric diseases. Hardship cases are migrants who have no rights of social help in Germany and are in difficult situations like pregnancy, homelessness or severe sickness. I was not only impressed by these figures, in which so much human need is hidden, even more by the appearance of the female main worker, who has served here for more than 23 years. I saw her give attentive and sensitive loving care for the others with a sober look for what is needed in the moment, resolute acting and social competence. She finished her explanations with the words: The work has become more difficult, but still I love to work. Our second stop was the Haneberghaus of the Abbey St. Boniface. “No rules, but open doors” is the motto of the monks and their many volunteers who help the homeless. More than 200 people get a warm free meal every day, prepared in the kitchen of the Abbey. During one year about 3500 people will get the clothing they need to stay warm, 4,000 have access to bathe themselves, and 2000 people get medical treatment they need. Located near the main railway station in the middle of town the Abbey is an important place to go for persons in need. Many homeless people are in need of extensive help. Especially during the cold season they can’t survive without warm food, clothing and possibility for washing. The most challenging place is without a doubt the doctor’s practice where two doctors work- one of them our Sr. Antonia- with some co-workers. Most of the homeless have inhibitions to visit a doctor. Many people have no health insurance and therefore can’t consult a doctor. The third stop was the alcohol-free Restaurant Zum Steg (the little bridge) one of the many offers of club 29, an organization which helps persons with alcoholic problems. A social worker explained to us the different fields of help e.g. to care for singles in their housing, a meeting and contact point called “anchor”, dwellings with therapeutically help, offers for professional rehabilitation, self-help groups, a counselling center for traffic psychology problems and this restaurant. Because of the high rate of alcoholism in Munich these offers are indispensable. We were gripped by the report of a waiter in the restaurant. Like many other main and honorary helpers in club 29, he himself was an alcoholic and found help here. Now he works very engaged and grateful for this chance for professional rehabilitation and hopes to come back to a permanent integration into normal life. We will not forget our visit in these helping points for citizens in difficult situations and try not to lose sight for these persons behind a curtain of wealth and social security whose health and perspective of life is in danger, and for all those who care for them.